"So changing from the old dental office to the new office made me a little anxious. However, the employees at Peak Dental Health made me feel at home right away! I had 2 cracked front teeth and was not excited about having to get them crowned. I wanted the crowned teeth to look the same as my regular teeth. Dr. Nelson was so nice and I immediately felt at ease! He is very professional and has just done an amazing job and I finally have my wonderful smile back! Great dentist and staff. I would recommend them to anyone! Thanks guys!" "Fantastic experience! I hadn’t seen a dentist in years and was filled with embarrassment, shame, and anxiety and Dr. Nelson and his staff immediately made me feel comfortable and secure. I had some major issues to address and Dr. Nelson went above and beyond to create a plan that was affordable. I have had two appointments now, one being oral surgery and both times I f left with little to no discomfort. I didn’t have to take anything for pain, not even Advil, after oral surgery! This is an office filled with people who truly want to help people and I couldn’t be more thankful I am in Dr. Nelson’s care. He is extremely competent, compassionate, and I can’t thank him enough for giving me my smile back!" "I have always been scared to go to the dentist and did not go for a number of years, needless to say I had to get a lot of work done. The staff made me feel comfortable and got my dental work done in a timely manner. Overall it was a good experience and I received some advice to keep my teeth healthy and clean." Welcome to Peak Dental Health, the Broomfield, CO dental office of Dr. Brett Nelson! 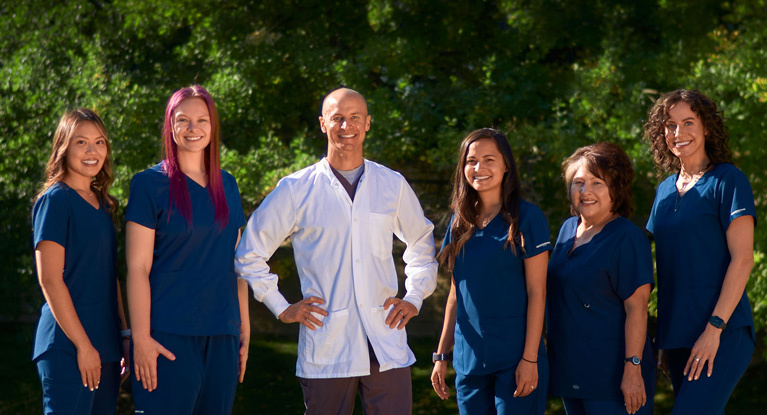 Our team is proud to provide gentle and comprehensive dentistry to residents of Broomfield and its surrounding communities of Erie, Westminster, Thornton, Denver, Boulder, Frederick, and Dacono. We look forward to getting to know you so we can provide dentistry that fits your unique needs. At Peak Dental Health, you, the patient, are our top priority. Even if you haven't been to the dentist in years, you will find a welcoming and judgment-free environment. Dr. Nelson spends time getting to know each patient on a personal basis, which allows him to customize treatment and help you confidently select the procedures that best fit your lifestyle and budget. You will also find a wide variety of comprehensive services at our dental practice so you can receive all of your dental care in one place. We want your time at Peak Dental Health to be stress-free and comfortable, so we provide amenities such as a beverage bar, blankets, and neck pillows to help you feel at home. Enjoy your favorite music with noise-canceling headphones during your procedure to make the time pass quickly, and wrap up your visit with a warm, scented towel to freshen up before you go. You will also notice our dental office is equipped with state-of-the-art equipment as Dr. Nelson stays updated on the latest technology and techniques. Technology such as 3-D imaging and the dental laser help us to make your experience at Peak Dental Health more comfortable. Dr. Nelson believes that everyone should have access to high-quality dentistry tailored to their specific needs. He works with many different insurance companies and offers financing options to help you fit the treatment you need into your budget with ease. We also make fitting dental appointments into your schedule convenient at Peak Dental Health with morning, evening, and Friday appointments. Whether you are looking to maintain your smile and your oral health, or you have teeth in need of repair, Dr. Nelson has the skills and expertise to help you. He also offers a wide array of cosmetic services such as teeth whitening, Invisalign, and porcelain veneers if you’re considering enhancing your smile. Are you ready to take the next step toward a healthier, more beautiful smile? Contact Peak Dental Health at 303-466-4646 today, and we’ll arrange a convenient time for your next visit.